Dimension is a 3D Printing company. They print functional 3D models from the ground up, layer-by-layer with durable acrylonitrile butadiene styrene (ABS) plastic. 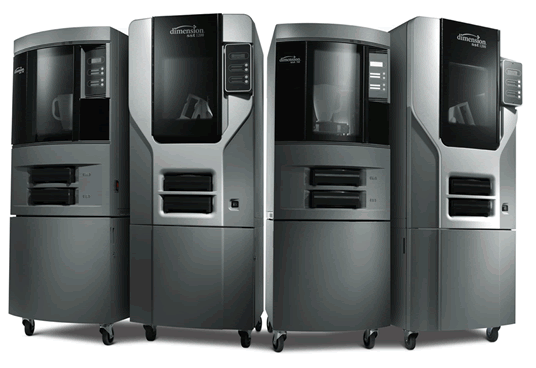 Dimension uses both Fused Deposition Modeling (FDM) and Stereolithography (SLA) as their 3D Printing technologies. SLA models and patterns can be produced in a matter of hours from any popular CAD system. Starting with STL, IGES or CAD data, engineers will guide you through your most detailed projects every step of the way to guarantee timely turnover. Due to their accuracy and ability to reproduce intricate details, SLA models are perfect to use as form and fit studies, master patterns for a variety of molding techniques and concept models. You can colour-match a custom colour and texture your model to give your give it a production quality. SLA technology allows you to have a faster product turn around times compared to other 3D Printing technologies which helps you reduce costs. FDM, on the other hand, starts with an STL file from a CAD software. Two materials are dispensed from this rapid prototyping machine. One material is for support, while the other is for the model itself. A CAD file establishes a course for melted thermoplastics to travel and the model is built up, layer-by-layer, which is eventually cooled into a solid. Although different materials cannot be combined in this form of rapid prototyping, different materials can be used. FDM technologies are an easy solution to produce durable, detailed 3D Prototypes from your own workspace!